Wow, I feel like I have a ton of stuff going on right now, so I will try to sum it all up in one blog post. 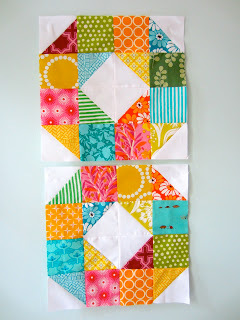 First up is my Patchwork Prism Quilt finish! Woo-hoo! Just to recap I altered the design a bit by making it a giant hexagon. I also decided to use the bindingless method. I basted the top to the batting, free motion quilted swirls, sewed on the back (right sides together) turned & flipped. A little handquilting and she is all finished. Hand quilting with perl cotton around the pieced triangle/hexagons. Lots of my favorite fabrics in the quilt, like Heather Ross' "Far, Far Away", volume 1. Just out of the dryer puckering. Love a quilt fresh out of the dryer! As soon as I saw Alexander Henry's La Paloma (in multi) fabric I knew it would be the perfect backing. 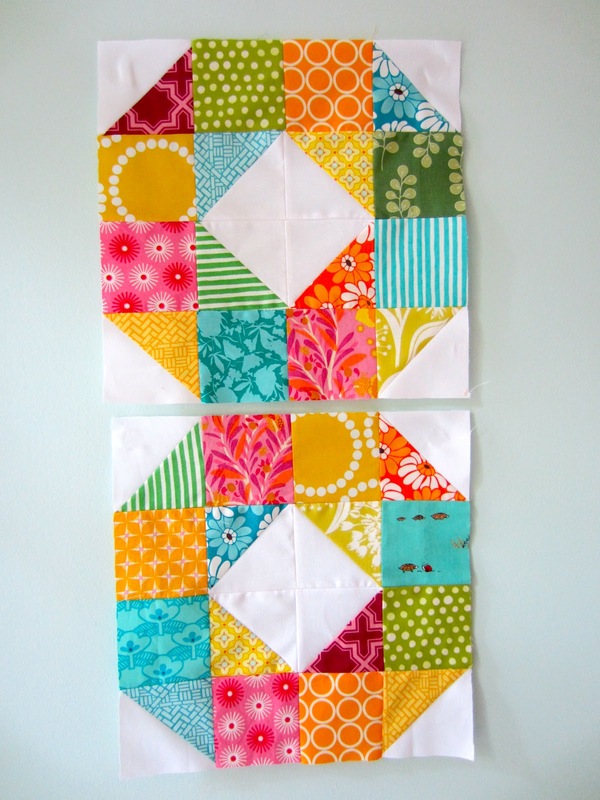 These are my Patchwork Wheel blocks for do. Good Stitches June in Joy Circle. They are all packaged and ready to go across the ocean to Fiona, who will so graciously assemble the quilt for Project Linus. Next up are some etsy orders using my Fussy Foldover Basket tutorial. This fabric is all from Heather Ross' "Far, Far Away Volume II." i'm so excited to tell you about this event!! 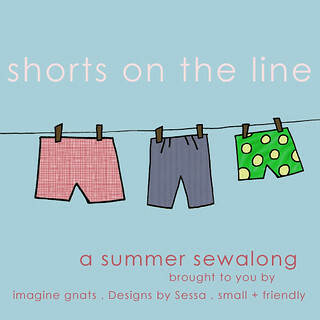 this july, imagine gnats, Designs by Sessa, and small + friendly will be hosting "shorts on the line", a summer sewalong. for the first three weeks in july, we'll be sharing guest posts with shorts inspiration, tutorials, and pattern reviews. those sewing along at home will have a chance to be featured in our sewalong round-up posts the last week of july.... and some *great* prizes, including fabric, patterns, and gift certificates! 7.1 shorts on the line kick-off! the full sponsor list and guest judge line-up will be coming soon. until then, get ready by joining the shorts on a line flickr group and check out our shorts on the line pinterest board for some short-y inspiration. grab the code and share the button! I have to tell you that the shorts sound like fun. Unfortunately, the green font color pretty much disappears into your green background, and I can't read it!